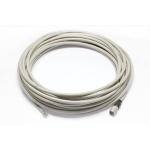 This 10 meter cable has a 6-pin Hirose plug on one end and leadwires on the other. It is compatible with the Basler Ace, as well as the power connector on the Runner and Aviator CL cameras. It also works with many cameras from other manufacturers, but please be sure the cable pairing and color coding is acceptable. This cable can be used in place of Basler p/n 2000034086 to access the ace USB camera's optically-isolated I/O. (The conductor color coding is different -- please see the drawing on the Resources tab.) Note this cable does not provide access to both of the ace USB camera's non-optically-isolated I/O, as Pin 3 ("Line 4") is not connected. Conductors #26 Brown, Pink, Green, Yellow, Gray, White.